Now I wanted to accept the offer to write a review and big up these covers. I was very hesitant at first to spend this amount on a cover that wasn't "official", however as Mackie decide to price their covers at a ridiculously high price (£150 pair) I felt like I needed to protect my £850 investment for the bumps and dings of loading these in and out of the car. I received these covers last week and I'm well chuffed!, they fit like a glove and are very well made... along with the padded inside to them it just gives me that confidence they are safe and sound in transit and storage. Good work Hot Covers, I certainly will recommend you and use your products again if I ever need some more - though I doubt it as these will protect my Mackie's for years. Incredible value for money, especially given the price of the official mace covers. 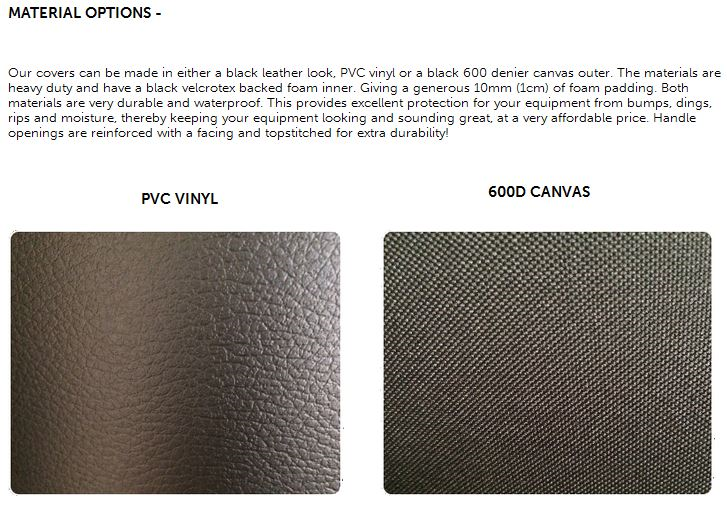 The PVC Vinyl outer material is fantastic at keeping dirt dust out, of which you can just brush off. 100% worth the price to keep your Mackie's safe and sound. The addition of the under strap is also well worth it's value to prevent the covers coming off in transit. Would definitely recommend these covers especially given the price gap between the official (and only other alternative) I could find on the web! Really thick and strong covers. Impressed!